How connected are we to our military? Not very, according to The Atlantic’s current cover story, which asserts that “however much Americans ‘support’ and ‘respect’ their troops, they are not involved with them, and that disengagement inevitably leads to dangerous decisions the public barely notices.” It wasn’t always this way: At least 3 out of 4 Americans born before 1955 had a parent, spouse, sibling, or child who served in the military; for those born since 1980, the number is only 1 in 3. The article’s interactive map enables readers to view military enlistment rates by 3-digit ZIP code prefixes. Almost everyone in King County lives in the 981- or 980- ZIP codes. For 981- ZIP codes (Seattle, Shoreline, Lake Forest Park, Burien, Tukwila, Renton-North, Normandy Park, Des Moines, and SeaTac), per capita enlistment from 2000 to 2010 was 19.6 per 1,000 population (38,295 individuals). For 980- ZIP codes (everyplace else except the northeast corner of the county), the number of enlistees was lower (16,550), but the enlistment rate was 1.5 times higher – 29.9 per 1,000 population, suggesting that Seattle residents are less likely than those in other parts of the county to have close family connections to active-duty military. A 2013 report from King County’s Department of Community and Human Services (DCHS) shows a similar pattern for veterans, with almost three-quarters of the county’s 127,000 veterans living outside Seattle. While most Communities Count analyses found no differences by military status, a couple of results are worth noting. First, veterans were significantly less likely than non-veterans to report that they experienced discrimination during the past year. This suggests that “support and respect” for the military is alive and well in King County. Another notable finding, while not surprising, was that veterans had a higher rate of disability than non-veterans. According to the DCHS report, it’s likely that more than 20,000 King County veterans have experienced Post-Traumatic Stress Disorder (PTSD), with as many as 12,000 reluctant to seek treatment or support. King County’s Veterans and Human Services Levy has improved the quality of many lives by increasing access to veterans’ services in South King County and increasing PTSD community education and professional training. The Atlantic’s cover story suggests, though, that our military needs more than reverence and services: It needs the public and its elected representatives to become engaged enough to insist on accountability for high-level decisions that put our soldiers at risk in endless, expensive, and possibly unwinnable wars. King County is ringing in the New Year with a January 7th Town Hall event designed to catalyze action on behalf of the county’s youngest children. Brain science tells us that quality early learning environments help children develop their full potential. Attendees of this event can participate in building and sustaining a vibrant early learning community that will benefit our region for generations. For background on the benefits of quality early learning, watch an 8-minute video in which economist and Nobel laureate James Heckman explains why Childcare is a Social and Economic Issue. If you are an elected official and would like to participate in the working lunch associated with this event, please reach out to david@bezosfamilyfoundation.org. The event is proudly supported by the Bezos Family Foundation, Kindering, The Road Map Project, SOAR, Open Arms Perinatal Services, and United Way of King County. 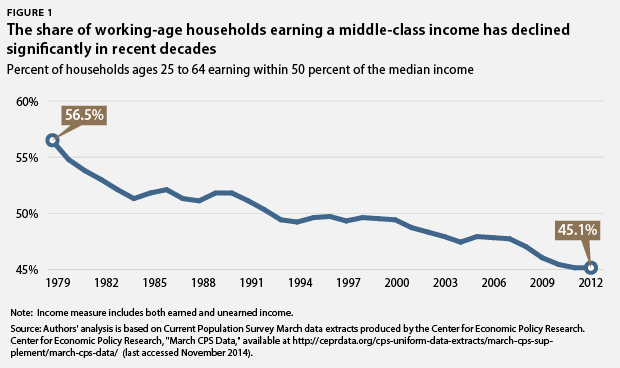 America’s middle class is on the move — but it’s not moving up. According to the Center for American Progress, only 45% of American families qualify as middle class, down from almost 57% in 1979. And research by a U.C. Berkeley economist found that during the “economic recovery” years of 2009 to 2012, the richest 1% of Americans received 95% of all income gains. In King County, economic recovery has been strikingly uneven by race: by 2013, the proportion of Black households with income below the Federal Poverty Threshold was up to 35%, significantly higher than all other race/ethnicity groups except those identifying themselves as “other race.” Communities Count presents data on wealth and income inequality in the Income section. Income inequality shrinks the American middle class.